Dorothy Masuku (Masuka was her stage name) has died at the age of 83. She was an African musician of note, but also much more. I was once shown the script for a biopic purporting to tell the early story of the late singer. It was highly professional, but a shallow, deeply patriarchal thing in which Masuku’s pioneering work as a composer, her acute and precocious political consciousness and proud pan-Africanism were sidelined in favour of a narrative of affairs and flirtations. The sidelining continued. Masuku was not simply the “jazz singer” many newscasts have labelled her, although she certainly was that too. And she certainly had a life worthy of a serious biopic. Yes, Masuku was a singer. But she was so much more: a composer, a hero of the struggle, and an architect of the discourse of popular African liberation music. Masuku was born in Bulawayo in then Rhodesia in 1935. Her father was a chef, originally from Zambia, but her mother, Liza Mafuyani, was a Zulu-speaking South African whose family originated from the province of KwaZulu-Natal, and whose sister lived in Soweto. Her maternal grandmother had been a sangoma. Masuku spoke later of the spiritual sources of inspiration for her songs. They often came to her in dreams, and she would immediately sing them to somebody else in the house, so that elusive memory was captured. She was signed to the Troubadour record label in her early teens after impressive performances at her school concerts. She worked with the greatest bands of the period. Historical narratives of jazz in that era focus on the solidarity among male musicians. But when Masuku spoke of those days at a recent panel discussion, she revealed a different story. There were links and solidarities among women musicians, from her tuition in Yiddish lyrics with actress Sarah Sylvia to the protection from male predation that she, as one of the youngest performers, was given by the older women on those tours. During her teens, Masuku composed and recorded close to 30 singles, several of which achieved major hit status. In the mid 1950s, Zonk music magazine opined that the only artist who was outselling Masuku in South Africa was American crooner Bing Crosby. She later wryly noted that the rewards were never commensurate. She’d be bought a dress, or given “spending money” for her work, never a contract, wage or royalties. Masuku wrote and recorded in Zimbabwe, and also in multiple other African languages in Malawi, Tanzania and Zambia. Her work was also performed by other South African artists in exile, notably Miriam Makeba. Because of the fragmented, semi-formal nature of the African recording industry in the 20th Century, no complete discography of all her credits exists, but it is likely the total of her compositions in all African languages exceeds 100. A Masuku liberation song – ‘Bazuka’. It’s so hard in this world: Lord, help us to be free. Two of her other songs, Dr Malan (“…has difficult laws”), named after Prime Minister, DF Malan, who lead the National Party with its policy of apartheid, to power in 1948, and Lumumba (speculating about who murdered the Congolese anti-colonial leader, Patrice Lumumba so infuriated the South African police’s notorious Special Branch that they seized and destroyed the master tapes. No copies can now be found. Dr Malan was the first South African song by any artist – let alone a young woman not long out of school, and not yet 20 – to call out an apartheid minister by name. Dorothy Masuku celebrating African leaders with her song ‘Ghana’. Masuku clearly and explicitly identified herself with African nationalist liberation struggles. After travelling across Africa, she was moved by the ANC to London. She performed at the London Palladium, for BBC-TV, and in various shows with musicians Sir John Dankworth and Cleo Laine. Later, she spent a brief period back in then Rhodesia, fleeing again to Zambia ahead of Rhodesian Prime Minister Ian Smith’s Special Branch. She spent 16 years in Zambia, performing and earning a living as an air hostess – pioneering that career as an elegant, intelligent independent woman with one of the earliest independent African airlines. 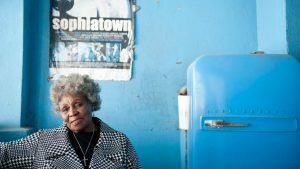 During her 31 years of exile, she was repeatedly refused entry to South Africa by the apartheid authorities, having been declared persona non grata. She returned only in 1992 and immediately began performing and composing new material, something she continued to do to the end of her life. She recorded four further original albums, as well as releasing a collection of much of her historic material, Hamba Nontsokolo. Masuku featured in all South Africa’s major jazz festivals. Two years ago, she starred in the New York Town Hall concert commemorating the Jazz Epistles alongside Abdullah Ibrahim and Ekaya. She was always a compelling performer, and never failed to draw standing ovations. I once stood behind her in a bank queue on a sweltering day. Joining the rest of us in loudly complaining about the intolerable temperatures, she ended her contribution to the chat with a short, mesmerising single chorus of It’s Too Darn Hot. The last time I met her, last year, she was animatedly discussing buying a new home. She wanted trees and birdsong around her to create a peaceful space for yet more composition. In conversation with Kaya FM’s Nicky Blumenfield. Music, she told South Africa’s public broadcaster, was like breathing for her: it was her life. A stroke late last year took her out of public life, and she died on 23 February 2019. Hamba Kahle: may her great spirit rest in peace. The post Dorothy Masuku: Africa has lost a singer, composer and a hero of the struggle appeared first on SABC News – Breaking news, special reports, world, business, sport coverage of all South African current events. Africa's news leader..